One of the most interesting things in SQL Server from my point of view are Statistics and how the optimizer interprets them to produce optimal query plans. But today I want to write about something just happened to me and made think. This refers to the very first stage of the process, the creation. If we haven’t changed anything in our databases (or model), auto create statistics should be on by default which means SQL Server will create automatically statistics whenever it thinks that information would be beneficial to generate a query plan. This sounds like a treat, right? Sure, it is nice not to have to think which statistics to create and so on, but like everything, it can have a dark side. Maybe I’m going to spoil the whole story but this is how things happened. I was reviewing the logs for the last database maintenance which includes, of course, updating statistics. Then I saw there was one specific that took more than 10 hours to complete, which made me suspicious. So I tried to find out why. I didn’t specify FULLSCAN, but using RESAMPLE will use the last sample, if that was a FULLSCAN… there you go. See how [Rows Sampled] is the same as [Rows], so FULLSCAN was performed. And the number is not small at all. But the worst part is the one supposed to be most helpful and where the query optimizer gathers insights of the data to produce nice query plans, the Histogram. In this case doesn’t look very useful, right? Also you need to know that statistics for [N]VARCHAR() columns have a maximum of 200 characters in the RANGE_HI_KEY, so for a MAX data type like this is absolutely pointless. After seeing this, I got a bit concerned and I wondered if all other data types will create statistics automatically. So I decided to create a table with all data types to check it out! Note that I have to create a dummy default value to be able to generate some stats. Cool, that should be enough. Let’s see whether we have statistics in our table or not. Yeah, there you go, all these _WA_Sys_ stats tell me they have been automatically created (there is a flag in sys.stats if you don’t believe me) but I can see there are only 31, where I created 34 columns. That’s funny, let’s see which data types did get statistics. There they are. XML and CLR data types (geometry and geography are CLR) do not have statistics, and that means you cannot manually create them either. Just for the shake of it. So apart from these special data types, the rest just created the stats without any question, for good and bad. Pretty obvious, statistics are very important for the query optimizer so the fact of getting them off the shelf (it’s the default behavior) it’s a big win. Sometimes, statistics are not as helpful as we’d desire, and if we mix it with some other bad practices, like not using full-text indexes for [N]VARCHAR(MAX) and querying like any other column, which will trigger auto-create stats, the result can be a disaster. Is it time to panic and run in circles? Not really. If you spot something that makes you suspicious, there still some things we can do about it. This post is getting kind of long, but whatever, let’s dive into some light theoretical talk. Probably you use either your own scripts or Ola Hallengren’s ones to maintain both indexes and stats, but if you don’t, SQL Server still wants you to have stats up to date, so it will automatically trigger update statistics when they are out dated. 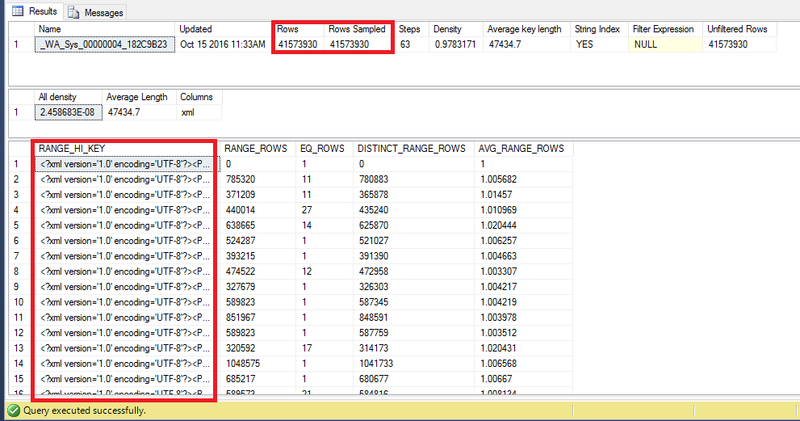 SQL Server (2014 and earlier) uses a threshold based on the percent of rows changed. This is regardless of the number of rows in the table. SQL Server (starting with 2016 and under the compatibility level 130) uses a threshold that adjusts according to the number of rows in the table. With this change, statistics on large tables will be updated more often. See how it speaks about the percent of rows changed. And that is misleading, for me at least, since each modification on that column counts, so if you modify the very same row again and again the counter will keep increasing, and while the rest of the table is totally unchanged, auto update stats (or even your scripts) will believe it’s time to update. And again back to BOL, that will happen before the query we want to run is executed, unless AUTO_UPDATE_STATISTICS_ASYNC is ON, and the update is delayed to a better time. Now go figure if my 10 hours update stats was triggered because someone run a query instead during a maintenance window… ugly stuff there. You still can do some tricks like updating stats manually with no rows and NORECOMPUTE and that will kill your stats until you revert it, but please be cautious and don’t jump to do it before evaluating all the consequences. Like most of the times, there is no one solution to fit all situations, so the better understanding we have about internals, the better choice we will be able to make and forecast the caveats of that choice. Thanks for reading and if you have any question, please ask in the comments below.